Headstrong North Carolinian Rodney Williford loves long bikes that go fast. A few years ago he developed a turbocharged GS-based Suzuki Outlaw Pro Street bike that was the first no-bar bike ever in the 6s, then quickly headed towards the 6.80s. His success got turbos banned from the 75-inch class—a debatable decision that some say led to Outlaw’s eventual demise at the end of last season. A turbo guy all the way, Williford switched to a Hayabusa and the Pro Sportbike class. After impressing initially, Williford failed to find success in that short wheelbase class. But now 68-inch Orient Express Pro Street is the marquee class in the MiRock Superbike Series, and Williford took the first win of the season at the Fast By Gast Spring Superbike Classic season opener at Maryland International Raceway (the scheduled March opener in Rockingham was rained out). Williford beat two-time Pro Sportbike champ Vinnie Demito in the final. Demito struggled with the clutch set-up on Saturday and was pleased to have gotten as far as he did on Sunday. A lane choice gamble on his semifinal bye run proved costly to Demito when he spun badly at launch in the left. The same left lane bald spot bit number one qualifier Mike Slowe, number two qualifier Curtis McDougald, number three Steve Jester, and number four Dimey Eddinger. “I ran the right lane earlier, and knew there was better grip down track in the left if I could just get off the line without spinning,” explained Demito. He didn’t, and got stuck back in the left for the final with Williford. This time he adjusted and spun only slightly—enough to lose a good, close race. 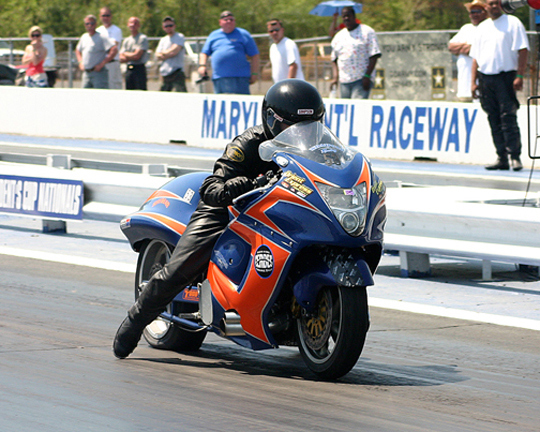 Williford’s winning Shybear Racing ‘Busa was originally built by Ronnie Mitchell Racing in Detroit. Rickey Grayson is a longtime player on the MiRock scene, both in pro classes and the intense grudge scene. But the winners circle often eludes Grayson and his 4th Generation Motorsports machines. Heading into the HTP Performance Real Street final round against class champion Keith Thompson, most railbirds agreed that Thompson’s winning experience would guide him to the trophy against Grayson on this day as well. But instead it was Thompson who gaffed, going -.164 red against Grayson. “It seemed like the starter held the tree kinda long and I just got antsy,” reported Thompson. Real Street was tight all day, with superstar Rickey Gadson losing round 1 to teenager Jeremy Teasley, his teammate from the AMA Dragbike circuit. Gadson’s nephew Richard qualified number two but also lost in round 1 when his HTP ‘Busa bogged badly at launch. Real Street wasn’t just tight, it was fat also, with 34 bikes entered—more than enough for two full fields. Thus was born Real Street B. Stephon Reynolds just missed the cut into the A Main, but came out on top in B. By the end of the day he was running quick enough to have made the main field, and that’s what B classes are all about—Sunday experience that boosts racer’s game more than spectating ever could. Former Pro Sportbike champ Anthony Navarro returned to the top of the heap, qualifying number one with a 7.77 and showing his usual model consistency on raceday. The 9 bike field had Navarro running number 2 qualifier (and fellow Pennsylvania contractor) Sean Walsh in the semi. “I knew that was gonna be my toughest round of the day, and it was,” said Navarro. Walsh had lane choice and gained a slight advantage on Navarro at the tree, but slowed slightly to a 7.80 while Navarro posted a 7.74 at 191 for the win. Donnie Taylor’s high revving GSXR1000 sliced its way through the field on the other side of the ladder, but hurt itself in the process and no-showed for the final against Navarro. In an all-Top Gas wheelie-bar bike final round in Quick 32, “Fearsome” Andy Baumbach took the tree and the stripe against Steven Shriver. 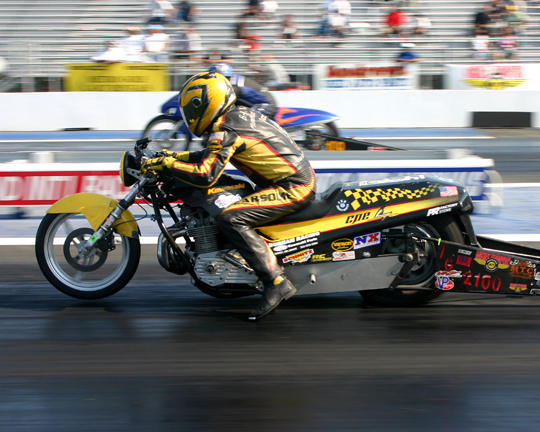 Saturday’s Fast By Gast Pro ET race was won by Michael Herman on a ZX10 streetbike over Jeff Shifflett and his traditional dragbike. Dale Hamilton road his practically naked Hayabusa streetbike to the Sunday win when Jay Windsor went -.001 red aboard his banana yellow dragike. Hamilton then beat Quick 32 winner Baumbach in the big money run-off when Baumbach’s Kawasaki dragbike ate its transmission. Saturday’s Schnitz Racing Streetbike went to Rick Anderson over Derek Christensen, and Jeff Strickler made the trip from New York pay off when local hero Shayne Proctor redlit on Sunday. The Lumberjack Report - NHRA O'Reilly Midwest Nationals, Hello Harleys!